Maui, also called the Valley Isle, is just a small dot in the vast Pacific Ocean, but it has the potential to offer visitors unforgettable experiences: floating weightless through rainbows of tropical fish, standing atop a 10,000-foot volcano watching the sunrise color the sky, listening to the raindrops in a bamboo forest. The second largest Hawaiian island has a smaller population than you’d expect, making Maui popular with visitors who are looking for sophisticated diversions and amenities in the small towns and airy resorts spread throughout the island. Intelligent, playful, and plentiful, Maui dolphins flourish in the warm waters of the Pacific in every season of the year. A chance to swim with dolphins in Maui is an unforgettable part of an island getaway and a simply amazing option for eco-tours. Many people wouldn’t consider a trip to paradise complete without dolphins as a part. These animals have been a feature of island lore for longer than anyone can remember and they continue to enchant and delight. In ancient times the Maui luau was referred to as the ‘aha ‘aina which is the traditional way to celebrate many different events and festivals. The celebration of Maui weddings always encompasses some type of Hawaii luau defined by the different customs and background heritage of each family. With Polynesian and Asian cultures so intertwined in Hawaii, different ethnic influences make many a Hawaii luau distinct. Coming of age celebrations, family visitors, birthdays, anniversaries and more are always ritualized by a traditional Maui luau. 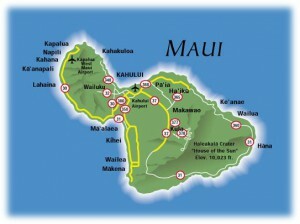 One of the most popular Maui tourist attraction is the Haleakala National Park, on the southwestern part of the island. Within it some of the true gems of Maui lie. The abundant Maui hiking trails inside the park are a haven for those wanting to explore the vast and varied terrain of the park in one of Maui’s oldest areas. Split into mountainous and wilderness areas, there are trails for a variety of hiking levels. Inside the Kipahula area of Haleakala National Park lies a genuine treasure, the Seven Sacred Pools. Haleakala Park officials refer to this area as the Oheo Gulch but it’s commonly known by tourists as the Seven Sacred Pools In Maui. Haleakala National Park is one of the most popular stopovers for tourists and full of a diverse range of things to do. The dormant volcano found in the park, The House of the Sun, is the tallest point in Maui at more than 10,000 feet above sea level. At 3,000 feet in depth, the idle giant draws in many sky gazers wanting to soak up the beauty of colorful sunsets at the Haleakala Crater. From the summit, others enjoy the exciting twists and turns when cycling from the peak to Paia on the North Shore. Soaring high into the clouds, the windy crest of Haleakala has temperatures more than 30 degrees lower than the mainland so make sure to dress warmly. Lahaina Hawaii is the hot spot on the island of Maui, second in popularity only to the many golden sandy Maui beaches. The historic town of Lahaina Maui is situated on the beautiful western shores and is the portal to the famous Kaanapali Beach and Kapalua resorts. Lahaina is the largest Maui town and faces the island of Lanai and western mountain range creating a spectacular scenic backdrop. Due to the town’s major appeal there are also numerous Lahaina hotels available for visitors to choose from. The hotels offer a great base from which to further explore the many Maui attractions around the cultural center of Lahaina Town. There are several ways to learn about and taste the delicious, traditional cuisine of Maui. Maui restaurants offer a great way to experience old-world Hawaiian dining as well as modern favorites. Advancing along with the rest of the world, the food industry in Hawaii has ballooned. Visitors will find a huge array of diverse cuisine, from classic European favorites to American standards to traditional Polynesian dishes. From Hana to Paia to Kapalua, there are many fast-food options, casual dining locations, and fine upscale restaurants featuring world-renowned chefs. Many restaurants in Maui offer a wide variety of menu choices while others specialize in one type of cuisine. 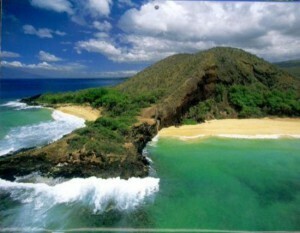 With 120 miles of coastline, Maui boasts over 30 miles of beautiful beaches. On these world famous shores you’ll find white, black and red sand beaches, renowned surfing and windsurfing spots as well as some of the best beaches in the world to simply swim, snorkel and sunbathe. Many are easily accessible beach parks with lifeguards, picnic facilities and restrooms. Others are undeveloped, “secret spots” found off the beaten path. Charter a boat, take a sunset cruise or go on a whale watching tour off the western coast of Maui. Sail the calm, clear waters of the Auau Channel between Maui, Lanai, and Molokai, an area famous for spotting whales. Most cruises and whale watching excursions depart from historic Lahaina Harbor or beautiful Maalaea Bay just north of Kihei. Most whale watching boat tours operate from December to May and last 2-4 hours. On Maui, shop to your heart’s content. Spend the day browsing shopping destinations like Whaler’s Village overlooking Kaanapali Beach, the upscale Shops of Wailea, or find made in Hawaii souvenirs at the shopping malls of Central Maui. From Lahaina to Hana, you’ll discover island treasures in stores across the island. One of the things that makes Hawaii such a popular year-round vacation destination is its incredibly mild climate. If you are cold in the wintertime, you can come here and get warm. If you are hot in the summertime you can come here and cool off. Many Maui residences have no air conditioning and no heater. Windows are almost always left open and ceiling fans and our cooling trade wind breezes provide all the air conditioning we need here in paradise. In order to understand Hawaii weather, you have to realize the different micro-climates that exist here. The windward side of the islands receive lots of rain … the trade winds blow in the moist ocean air, the mountains lift the air and cause it too cool, and it condenses and causes clouds and rain. The leeward side of the islands are in a rain shadow … they are much drier and hotter than the windward side. The summit area of the West Maui Mountains is the second wettest spot on the face of the earth … receiving 400 inches of rain a year! Yet in Lahaina, at the base of these mountains on the leeward side, the annual total is a sparse 12 inches or so! The trade winds typically blow from the northeast, leaving the southwest sides of the island dry and warm and producing rain forests on the north facing slopes. We often get phone calls from people who have looked at a 10-day forecast and are worried it’s going to be raining the entire time they are on vacation. If you are looking at a 10-day forecast on WEATHER.COM you need to realize that it doesn’t account for the different weather on the dry and wet sides of the island. Since it rains in the rain forest almost 300 days a year, their long-range forecast tends to skew toward reporting all that rain. It is not unusual for people to come here and find out that they don’t see a drop of rain all week, even though the WEATHER.COM extended forecast looked ominous. We recommend that you look at http://hawaiiweathertoday.com for a forecast that more accurately accounts for the true weather conditions around here. This Glenn James is based on Maui, and he’ll give you a great local perspective on what the weather is really going to be like. The other factor that contributes to our microclimates is elevation. The summit of Haleakala is 10,000′ and it gets cold up there! On rare occasions it even snows. The town of Kula is much cooler in the daytime than at sea level. If you are going to be exploring these upcountry parts of the islands, bring some clothing that you can layer. You also might want to check out the weather in Honolulu. The Star Bulletin website offers a lot of information on weather and sea conditions, and even a link for updates on volcanic activity.